Rousseau technicians’ work stations are the most complete and versatile solutions on the market. 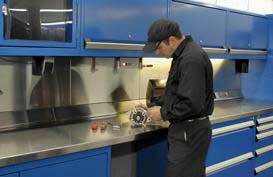 High-density automotive parts storage allows you to store small parts neatly and efficiently while reducing the amount of floor space used. With a lifetime warranty on the drawer sliding mechanism as well as unrivaled reliability and durability, Rousseau mobile toolboxes will be your trusty companion for everyday tasks, every day. Automotive Work Stations and Work Benches. 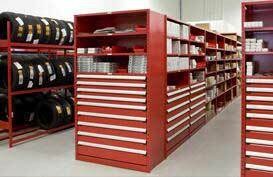 Total Tool is proud to represent Rousseau, the leading North American designer and manufacturer of flexible and high-quality storage solutions for automotive repair shops. Rousseau workstations are designed to make your workspace functional and organized. Because they are modular, they come in a variety of configurations to meet the needs of your shop and employees. There are multiple options to choose from, including stationary or mobile workstations. Rousseau products are modular. They fit together easily with each other to form complete systems. Furthermore, they are designed to accept a wide range of accessories, which allows highly personalized solutions to be created. Rousseau products are scalable so their solutions will grow along with your business. For example, if you already have a shelving system, you can add banks of drawers for storing small parts. A 400 lb. capacity per drawer, lifetime warranty on the sliding system, and exceptional customer service from the Total Tool team are just some of the value-added benefits that come with Rousseau products from Total Tool. View the complete line of Rousseau automotive work centers. Total Tool offers financing for your equipment purchase, click here to apply. Call your Total Tool representative today at 1.800.677.8685 to get complete information about the wide range of Rousseau automotive work station, storage products, and help in choosing the right solutions for your auto repair shop.